Nahanni completed a $12 million High Arctic facility with modular units to meet the needs of the Canadian Armed Forces. On a tight schedule, Nahanni completed a $12 million High Arctic facility with modular units to meet the needs of the Canadian Armed Forces in one of Canada’s most remote and unforgiving locations. The Polar Continental Shelf Accommodations and Recreation Complex project was completed in less than two years. With tight shipping schedules for the modular units that were required to keep this project on track and on budget, timing and coordination were key assets in making this project a reality. Nahanni worked diligently to ensure this $12 million project was a quality build that would meet the needs of the Canadian Forces in one of Canada’s most remote areas in the unforgiving conditions of the Arctic. High Arctic projects come with incredibly short shipping seasons. Winter weather usually starts near Resolute in October, and for this project, the earliest possible commitment to deliver to the site was early September. That meant we effectively had one month to ship all of the supplies, materials, and equipment we would need to this project. Coordinating logistics in the High Arctic is a delicate combination of art and science. We fast-tracked design and fabrication in order to have modules ready to ship at the earliest possible date, and assembled them before shipping to ensure fitment and quality. Nahanni also worked closely with our shipping partners to time the delivery of each module to coincide with the arrival of workers on site. That way, we were assured that the proper trades were on hand for assembly of each module. Through a highly coordinated schedule, Nahanni was able to reassemble the complex, install and commission mechanical and electrical systems smoothly, and eventually turned the project over to the client in February 2001 – a mere six months after we started installing the modular units on site in Resolute, NU. 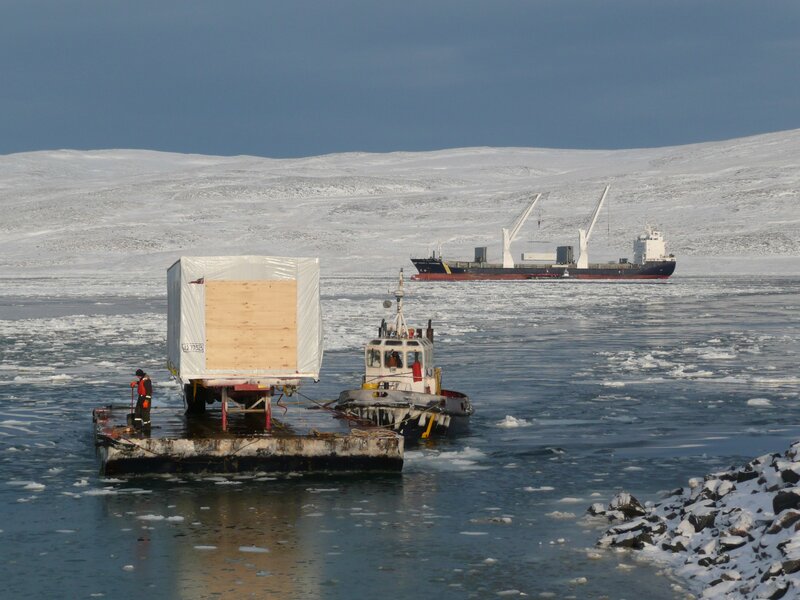 The modules were built in Matane, Quebec and shipped over 4,000 km to Nunavut. Nahanni and the Canadian Military entertained each other with fascinating maneuvers while sharing the same real estate in August. The military was camped all around our job site during that time while executing ‘Operation Nanook’. We were treated to a front-line observation opportunity of their drills, the remarkable C-17 aircraft, mid-air refueling demonstrations, and Arctic Recovery Diving. Nahanni made arrangements for locally hired workers to head down to the beach for the annual migration of the belugas and narwhals. This once a year opportunity is key to subsistence lifestyles in the High Arctic. This project was a fully equipped turn-key operation.